On the same day New York Times named Puerto Rico the number one place to travel in 2019, the Puerto Rico Bed and Breakfast Association owners met with officials from the Puerto Rico Tourism Company to improve their already awesome partnership. The Puerto Rico Bed and Breakfast Association comprises about a dozen small property owners from all corners of Puerto Rico. This includes Fernando Seda and Joonseong Kim of 4 Casitas Bed & Breakfast; Carla Arraiza of Dos Aguas Bed & Breakfast; Eddie Ramirez of Casa Sol Bed and Breakfast; Margarita Buenaga of Casa Isabel Bed and Breakfast; Florin Lepadatu of Casa Flamboyant Bed and Breakfast; Yaiza Arvelo, and her husband Edwin Cortés Seguinot, of San Sebastian Bed and Breakfast; William Puig of Casa Campo Bed and Breakfast; and Bill and Renée Humphrey of the Rainforest Inn Bed and Breakfast. 90% of the members of the Association were present, some having driven two or three hours to be there. Incredible! And what an amazing, successful meeting! Bill, of the Rainforest Inn Bed & Breakfast, remarked how he is constantly impressed by the interactions between the Puerto Rico Tourism Company and the local Bed and Breakfast Association. “There’s presently less than ten endorsed small bed and breakfast properties (and growing) on the whole island, but the Puerto Rico Tourism Company still helps us all so much,” he says. Today’s meeting focused on how the Tourism Company will continue to help our local bed & breakfasts overcome obstacles and attract new and old visitors to the island. 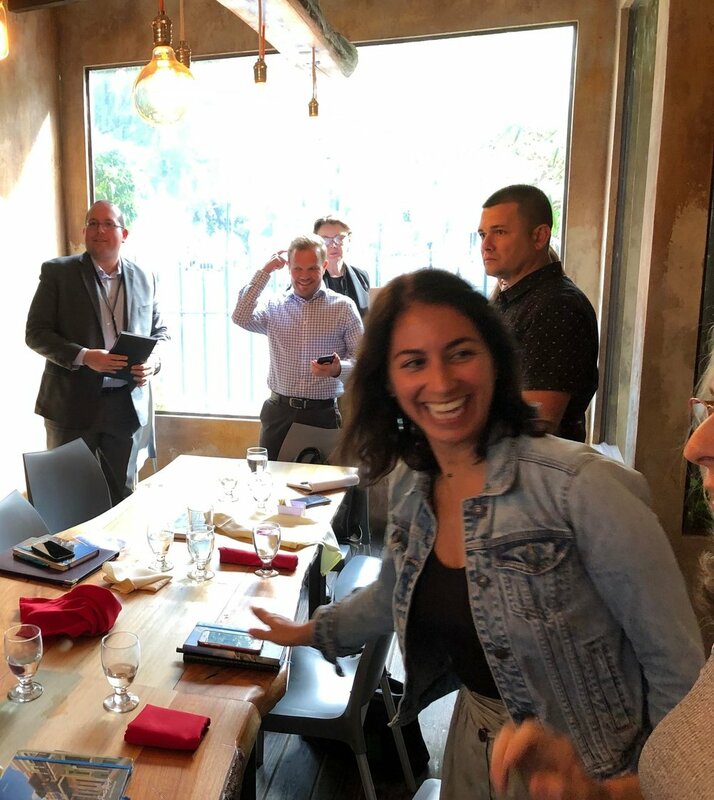 The Director of the Puerto Rico Tourism Company, Carla Campos, headed the meeting, which met at the Princesa GastroBar in Downtown San Juan. Campos told the group about her plans for a “boot-camp style meeting” soon intended to ensure things like the Incentivo Program are actually accomplished. The Incentivo Program would provide endorsed bed & breakfasts with a 30% tax break for construction projects and new additions, as well as other benefits. Campos is also arranging a meeting with Discover Puerto Rico to implement more international exposure for the bed & breakfasts endorsed by the Association. Carlos Romo was also present, as he will be in charge of implementing the Incentivo Program for tourism. In fact, he shared his personal cell phone number with members of the Bed & Breakfast Association so that he can directly field requests, issues, and concerns from each of the members of the Association. For example, if an owner is struggling to complete the necessary legal paperwork to receive the tax break, Romo will be only a phone call or text away. Romo will also be available to help with training new staff members. In fact, the Company in general pledged their support to do everything they can to help endorsed bed & breakfasts educate their employees to best serve tourists. This will also be providing free trainings and educational materials for owners and staff. Members of the Tourism Company and Bed & Breakfast Association talk business as they finish up their meal. The Puerto Rico Tourism Company is so eager to help the Bed & Breakfast Association because they understand that endorsed, licensed bed & breakfasts must compete against short term rentals who do not have any of the same large operating expenses and concerns: commercial insurance, a health and fire department license, inspections by the Puerto Rico Tourism Company, and so on. The Company recognizes that endorsed bed & breakfasts represent the island to tourists very succinctly; each property provides a “local” experience via intimate knowledge of the region and its history and can also share first-hand the ways that the property supports surrounding economies and ecosystems (in each individual Bed and Breakfasts unique location “out on the island”). One goal of the Association is to continue strengthening this branding of intimate, local knowledge throughout the entire network of bed & breakfasts on the island. Eddie Ramirez, the founder of the Association, explains that creating brand standards and guidelines will ensure that, no matter what property you stay at, your experience is fulfilling. Owners of these properties happily share their tips and tricks for having the best time on the island and how to experience it all “like a local.” They get as much joy out of hosting guests as guests get from staying with them. Carla Arraiza is clearly pleased with what the group accomplished. Part of the branding Eddie imagines will be done with the help of Ernesto “Tito” Izquierdo’s company, Puerto Rico Desde del Aire. A master cinematographer with a background in television, “Tito” will produce an imaginary road trip to all the endorsed bed & breakfasts by creating a well-edited video, especially drone shots. Though imaginary in the video, this road trip is entirely possible! Travelers can book two-night (or more) stays at each of the endorsed bed & breakfasts and ensure they see every corner of the island from the eyes of a local. A soon-to-be unified reservation system for every endorsed bed & breakfast on the island will simplify this booking process for travelers. With the much-appreciated and continued support of the Puerto Rico Tourism Company, the real Bed & Breakfasts of Puerto Rico will be able to share their knowledge and love of the island with more and more guests. Members of the Association seem humbled by the support of the Company, as they know that, even when considered together, they have a smaller staff than any single big “resort style” hotel. If what New York Times claims is true and conscientious travel (rather than old-school “tourism”) is the big trend of 2019, the Puerto Rico Bed & Breakfast Association has an exciting, busy year ahead of them; and they could not be more excited! A panorama of the group inside Princesa GastroBar meeting room. A lovely space for a productive meeting.